I’ve always been an avid shopper – starting at the age of ten. My mom and sister and I would go to the big department stores in downtown Pittsburgh and split up and meet in a few hours. The stores were close together, but in between them, I discovered a used book store. What a treat! They had shelf after shelf of paperback books for an incredibly low price; the only catch was, for some reason they had to remove the book’s front cover. No big deal; the rest of the book was there! Over the years, I’ve discovered yard sales and thrift stores — fabulous places to find bargains, in addition to great sales at discount and department stores. And I’m so grateful for all the wonderful, low-cost things I’ve found! 3) Numerous framed prints (see tips in my blog post on how you can save a ton of money on framed prints, too). Have never paid more than $15 each for any of them. 4) Jewelry – necklaces, bracelets and earrings. My favorite story about bargain jewelry is when my friend C and I went to a yard sale and I showed her this thick, gold necklace that I loved. Then she bought it! I was a little miffed because she’d never done anything like that before, but I found out why she did it on Christmas when I opened my present from her — and there it was. 5) My solid wood living room coffee table, bought for $20. 6) A ton of some of my very favorite clothes and shoes. Need a separate blog post for those! 7) Wedding reception items. I planned and coordinated my son’s wedding and bought all the glassware for the reception at yard sales and thrift stores. Got boxes of bar quality drinking glasses, lots of beautiful glass serving dishes, vases, decorations and more. For details, see my ebook “How to Have a $30,000 Wedding for Less Than $10,000” on amazon.com. 8) Lawn equipment, including a $2 Scott spreader, a $10 machine that rolls across the lawn and picks up leaves in a canvas sack, an inexpensive blower, a couple edgers and a FREE push lawn mower. 9) Many lamps for less than $5 each. Attractive lamps bought from a yard sale or thrift store cost way less than a single lampshade bought at a “regular” store! 10) Scrapbooking supplies. Have had the good fortune to go to yard sales of women who were getting out of the Creative Memories home consultant/party business and bought their remaining inventories for a song. 11) Piano sheet music. Got a big box full for $1. 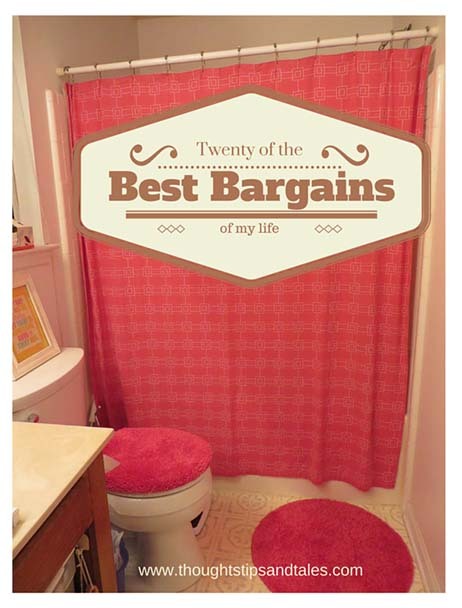 12) Shower curtains. Bought at least three of them – one beige, one pink, one yellow – in perfect condition for $2 each, and later saw one just like the pink one in Target selling for $24.98 (see photo above). 13) A sturdy Good Wood kitchen table and six chairs for $50. The top was a little marred, but I put cute tablecloths on it and nobody knows the difference. 14) Suitcases. Have bought several nothing-wrong-with-them rolling suitcases – all for less than $10 each. 15) Chest of drawers (formerly a diaper-changing unit) for $20. 16) A file cabinet in excellent condition for $15. 17) Several carpet runners for $5 each. 18) A sturdy TV stand ($15), about five bookcases and a couple wooden wardrobes (none for more than $10 each). 19) Books – hundred of them. At $1 for hardbacks and $.50 for paperbacks, that was a huge savings, since I’m an avid reader! 20) Porch furniture. Bought a white rattan chair ($10) and a brown rattan loveseat and table for $25. As you see, there’s almost nothing you can’t get at a great price if you’re willing to get out there and look for treasures! This entry was posted in bargains, decorating, home decorating, saving money, scrapbooking, thoughts tips and tales, yard sale and tagged bargains, furniture, home decorating, saving money, thoughts tips and tales, thrift stores, yard sales. Bookmark the permalink. Inspirational post! Thanks for sharing! You’ve definitely found a lot of treasures! Another great place I like to look is Craigslist! I enjoy watching Antiques Roadshow, you never know what you “will find”! I’m a new follower from “Wow Me Wednesday”! Bought a hardback book for my husband and when he opened it there was $1700 inside. We returned it to the sale and got a thank you note with a reward, from the elderly owner who forgot what she had done with the $..There was no way we would have kept it, we wondered if it was for the “tax bill” or “house payment” etc. This was the best garage sale find, with a very happy outcome. Wow! That sure would be a surprise! And thank goodness you’re honest and returned it. I’m a big fan of buying shower curtains just for the fabric. The standard size is 72 x 72″, which is a lot of material and these days they come in a variety of attractive (non-plastic) colors and prints. My best deal was when some manufacturer wildly overestimated consumer demand for shower curtains labeled “Dry Clean Only.” After I stopped giggling, I scooped up three that wound up as a table topper, sofa cushions and a dining table runner. Great idea — and a funny story! Thanks for stopping by.